UN to honour 2 Nigerian fallen peacekeepers – Royal Times of Nigeria. Two fallen peacekeepers from Nigeria, Commodore Christopher Ademu Abu and Sgt. Mayehm Norbert, are among the 117 that would be honoured with the posthumous Dag Hammarskjöld medal. The Dag Hammarskjöld Medal is a posthumous award given by the UN to military personnel, police, or civilians who lose their lives while serving in a UN peacekeeping operation. The medal is named after Dag Hammarskjöld, the second Secretary-General of the UN, who died in a plane crash in what is now Zambia in September 1961. The UN, in a statement said the Secretary-General, Antonio Guterres, would award the Dag Hammarskjöld Medal posthumously to the 117 fallen heroes at the UN Headquarters on Wednesday. The Correspondent of the News Agency of Nigeria (NAN) reports that the UN headquarters would observe the 2017 International Day of United Nations Peacekeepers on May 24. “Two fallen peacekeepers from Nigeria are among those to posthumously receive the Dag Hammarskjöld medal , Commodore Christopher Ademu Abu, who served with the United Nations Multidimensional Integrated Stabilisation Mission in Mali (MINUSMA). “And Police Sergeant Mayehm Norbert, who was deployed with the United Nations Mission in Liberia (UNMIL),” the statement read. 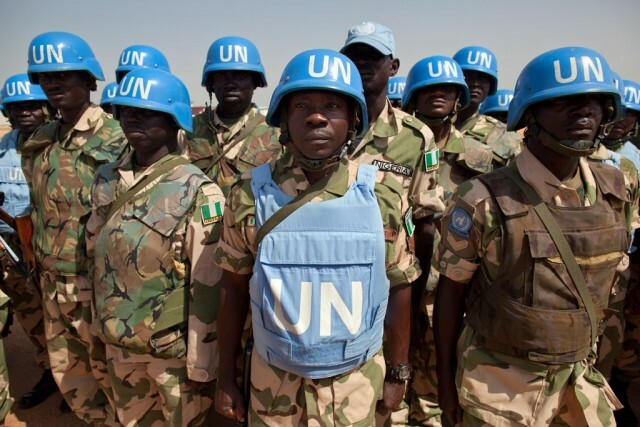 Nigeria is the 14th largest contributor of military and police personnel to UN peacekeeping. It currently deploys nearly 1,700 uniformed personnel to the UN peace operations in the Central African Republic, the Democratic Republic of the Congo, Haiti, Lebanon, Liberia, Mali, South Sudan, Sudan and the Western Sahara. Guterres will lay a wreath to honour all fallen peacekeepers and will preside over a ceremony at which the Dag Hammarskjöld Medal will be awarded posthumously to 117 military, police and civilian personnel who lost their lives while serving in peacekeeping operations during 2016.